… and what that means for the tester. I’m still in the Healthcare project where we’re strangling small pieces of functionality out of a big monolith of software that was built over the course of 20+ years. Next month, we’ll put our first real strangled functionality into production. In a docker container. With horrible UI. Yes, releasing is a matter of months for us. That’s not what I’m worried about right now. The past week, I noticed myself saying: “I don’t care about quality.” and “We don’t need to fix that logical gap.”. Things I wouldn’t be able to reconcile myself with when I was a tester. My view on releasing, and the quality of said release has changed as well. That ‘I don’t care about quality’ was mainly to make a point. It wasn’t correct. I just care less about certain aspects. The UI is not well structured, black and white and far from appealing. But everything we need is there. Looking at our new screen, any user will curl their upper lip. Additionally, when you open a (closed) file from last year, you’ll get a blank screen. No user friendly message, apology or workaround. It’s not optimal, but it’s just not important to me and I’ll gladly defend that to anyone. What does interest me are two very different aspects: Security and Performance. Positive User Feedback is currently a low priority for me. We’re doing a very minor change when it comes to our users. However, the change touches upon some very important data. Data you don’t want to have stolen. That’s my first priority. The second one is successfully working closer with our Operations department. The better we can make that collaboration, the easier we’ll have it in the future. A third priority is making it run smoothly in production at all. If it’s a flop, it’s merely a flip of a parameter to revert. These kind of decisions don’t make me particularly popular with the testers in the team. I apologise for this, yet they are the product of careful listening and thinking. What does this mean for Testers? In the aforementioned context, it can be daunting to be a tester. They might feel out of the water concerning expected expertise and they might feel discouraged because many issues are dismissed. However, they can gather information on as many potential points of failure as possible and provide possible alternatives. They might not know Security Testing or Performance Testing, but they know Risks and have the skills to identify weaknesses. I expect them to use their words and arguments to do everything in their power to make sure I abandon the project as a whole. … and have the patience, respect and open mind to accept unpopular decisions made by the PO. Not that this has been an issue as of late, but I clearly remember my own frustration when faced with what my testers are facing now. I guess it’s never too late for some lessons in humility. 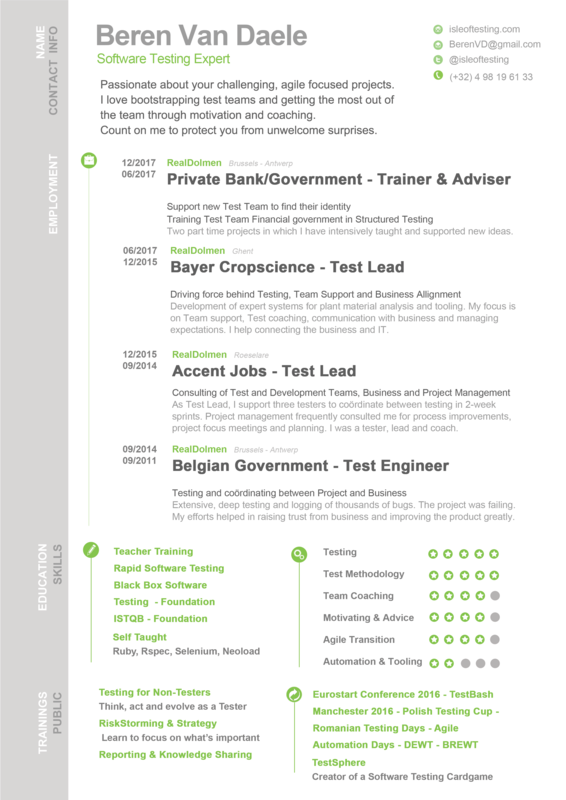 In the beginning of last year, I moved from a Test Consultant to a Product Owner role and I haven’t written much since. Gaining so many insights over that period from: My role change, remote working teams, testing strategy workshops in other companies, Agile transformation of a HealthCare company and much more. It’s been a tumultuous year, but a rollercoaster in learning and insights. The end of the ride is not in sight. My first insight I wish to explore is how I, as a PO, am dependent on testers: My in-team tester, our automation specialist and the separate team of testers. In my role, I am mainly concerned about delivering a quality product that people are sufficiently happy with. It shouldn’t be stellar. It doesn’t have to be perfect. It has to be an improvement. That’s the context I work in. We’re trying to replace a big monolith of ancient software into smaller pieces of understandable, working software using strangling patterns. A strangling pattern in short: You identify the boundaries of a piece of functionality, you build a completely, separate duplicate of the functionality and feed the exact same inputs to both pieces of functionality in a test or production environment. Then you monitor the outcomes. When, over time, the outcomes are consistently the same you can replace the old functionality with the new. This pattern is used in situations where functionality has become so complicated, so bloated that any change can cause a ripple effect across the software destroying just about anything. Talk to & prepare other testers about the changes that are coming. Hand over the changes to the separate test team so that they can see what actually was finished. In other words, he’s a bit out guardian angel. Not the kind to swoop in and save the day, but the fairy-god-person type that’s always watching our backs and supports us to overcome problems ourselves. To be honest, when it comes to automation on the service or UI level, it’s not profitable for us yet. Our specialist has her hands full maintaining old selenium scripts for the big monolith. Voices constantly rise up whether these scripts are worth the investment time and again. For now, we persist. Next to the maintenance, she’s also involved in pair development with the others in the team, learning about implementation new user stories. She’s involved in pipeline improvements and team discussions about for example: the depth and effort the team wants to put in TDD practices and so on. With our move to Windows containers for our test systems and hopefully also production, she’ll have her hands full supporting the team in providing checks and information on stability. For I want them to streamline everything so well, that in the future they can give me a button: a button that I can push at any time, that deploys our current devbranch into production. This is a whole different article that needs to be written. Potentially, this is the point in the Agile Transformation that has had the biggest change and effect on the reliability of our releases of all. These changes can be attributed to changes across the whole development process, but it is a marvel to observe how much more efficient the test team has become. I saw them, under guidance of great test consultants, abandon most of their documented test scripts and develop mindmaps and checklists. They focused on efficiency, speed and supporting rather than complaining, defending and acting like martyrs. The testers I work with cover a lot of ground. They focus on results and moving forward, by amplifying the team through information. Information that is actionable and valuable. It hasn’t always been like this. Together, we’ve come from a very ‘structured’ process where people were working in separate roles on a monolithic software problem, making our situation worse and worse by the day. Strong consultants that support with knowledge and learning. Little change after little change each of us started to see a little light in the darkness. That’s all one needs to keep moving forward. So we joined hands and started in that direction together.